During the global financial crisis integrated markets and financial institutions operating across borders clashed with supervisory and regulatory architectures that remained largely nation bound. This spurred a debate on the costs and benefits of more internationally integrated and coordinated prudential policies. This paper presents theoretical explorations of the policy and governance challenges associated with forming and running a regulatory and supervisory union when national prudential authorities have different objective functions. 1. Introduction1)The views in this paper are those of the author and should not be attributed to the IMF, its Executive Board, or its management. I would like to thank Elena Carletti and Robert Marquez for several discussions on the issues in this paper. The crisis has brought international financial linkages to the centre stage of the economic policy debate. Internationally integrated markets and financial institutions operating across borders clashed with supervisory and regulatory architectures that remained largely nation bound. This regulatory fragmentation hindered effective policy action both before and during the crisis. Before the crisis, it limited the monitoring and understanding of cross-border linkages and hindered efforts to contain growing imbalances. After the crisis started, it led to often locally-driven and globally-inefficient policy actions; especially in the context of bank resolution (IMF, 2010; BIS, 2010). Against this background, some observers have argued that (akin to the traditional trilemma of international economics between monetary policy independence, fixed exchange rates, and free capital flows) a “financial trilemma” exists between financial stability, free capital flows, and fragmented regulatory and supervisory architecture with nation bound safety nets (Schoenmaker, 2011, Obstfeld, 2014). In response, there have been renewed efforts to improve cross-border cooperation and information flows (see for instance, initiatives such as the Financial Stability Board); but also greater acceptance of capital flow measures as a tool to preserve macro-financial stability. Tensions between the prudential architecture and market structure were particularly evident in the euro area where common markets and the single currency stood in stark contrast to a fragmented supervision and bank safety net. The result was strengthened links between a country’s banking system stability and fiscal health. During the boom, in several countries, banks grew to a scale that challenged national supervisory capacities. After the bust, the implicit and explicit liabilities associated with the size of these banking systems overwhelmed national fiscal resources (Goyal et al. 2013). The euro area has answered these challenges with the nascent Banking Union based on a Single Supervisory Mechanism, a Single Resolution Mechanism, and an agreement for the mutualisation of at least a portion of the safety net. These reforms will hopefully provide more effective and coherent supervision and help to weaken sovereign-bank-real-sector spirals. However, supervisory/regulatory unions also present costs and challenges. For instance, it may become harder to tailor policies to an individual country’s needs; and it may be difficult to design effective internal governance for a supranational regulator. This begs the question of how far should a Banking Union extend. Can we achieve enough stability through international cooperation? If not, what are the main factors one should look at to decide whether countries should join into supervisory/regulatory unions? And conditionally on a partial union being formed, how do incentives to join in change for the countries left out? Finally, what are the governance challenges in a union where the original independent supervisors/regulators maintain significant power and functions? We are very far from a formal theory of what constitutes an optimal regulatory area. What follows are explorations of some of the relevant issues guided by recent theoretical papers on the topic. In particular, we discuss the challenges of forming and running a regulatory and supervisory union when country regulators/supervisors have heterogeneous objective functions. In recent years, technological progress and regulatory changes have led to the progressive integration of international financial markets. As a result, banks’ cross-border activities have become increasingly important, raising new challenges for regulators that have remained country bound. In this environment, prudential regulation and supervision generates cross-border externalities that neither regulators nor the financial institutions they are supposed to oversee might take into account. This section explores the implications of these externalities for the benefits and costs of switching to a centralized supervisory agency. And, in a multi-country setting, it discusses how the formation of a Banking Union by a subset of countries affects other countries’ incentives to join in. Here we follow the stylized model proposed in Dell’Ariccia and Marquez (2006). Consider a setup in which banks compete internationally, but are regulated and supervised by domestic agencies. These domestic regulators/supervisors’ mandate includes domestic financial stability and bank profitability. The latter may be the reflection of regulatory capture or more generally of the fact that supervisors care about all domestic stakeholders in the banks. Critically, this entails a trade-off. Tighter regulation/supervision will make the domestic banking system safer. But it will represent somewhat of a burden for the banks and reduce their profitability. Further, since banks compete internationally, these policy actions will entail externalities. Safer banks at home will improve stability abroad (for instance, by reducing counterparty risk). But more intrusive regulation and supervision may decrease bank competitiveness vis-à-vis foreign institutions, increasing its impact on bank profits. Under these assumptions, domestic agencies acting independently (non-cooperatively) are likely to reach an inefficient outcome. In this model, both externalities tilt regulators’ behaviour in the direction of laxer standards. Indeed, each domestic agency will not take into account the benefit that tighter standards bring to the other country (through its banks’ interaction with a safer banking system). But they will be concerned with the increased negative effect that tighter standards have on domestic banks’ profits because of the loss of international competitiveness. The outcome (in a Nash equilibrium) is one with excessively lax standards: a race to the bottom; or, more precisely, standards that are laxer than those that would prevail if the two domestic agencies were to fully take into account the cross-border effects of their policies. Now compare this setup (in which national agencies concerned solely with their respective domestic banking system set policies non-cooperatively) to one in which an international regulator sets uniform standards for all banks. The benefit of centralizing regulation is that it internalizes any externalities that may exist due to the integration of financial systems. From that standpoint, it is immediate from the discussion above that a centralized agency will impose tighter standards than independent regulators. The shortcoming is that centralization reduces flexibility in designing policy; at least to the extent that political economy considerations limit the regulator’s ability to tailor standards to individual countries under its jurisdiction. Then, there is a cost, if regulatory needs (and thus the optimal policy design) differ across markets because of institutional and structural reasons. Under these assumptions, a Banking Union is more likely to emerge (to offer a Pareto improving solution) between countries that exhibit a greater degree of financial integration and relatively similar regulatory needs. The degree of inefficiency under the “independent” solution is likely to increase with financial integration. And the cost of switching to a centralized agency is likely to be smaller when country needs are not too far apart. In practice, this means that a Banking Union is more likely to be beneficial (and politically acceptable) among countries with a greater foreign bank presence, cross-border flows, etc. ; and countries with relatively similar financial structures in terms of bank design (for instance universal banks versus narrow banks) and market structure. The nascent Eurozone Banking Union is in line with this prediction. The model also speaks to the incentives to form a Banking Union among a subset of countries when multiple financial linkages exist, and to how the formation of such a union changes the incentives to join for those left out. Relative to the simpler two-country case discussed above, the analysis of a multi-country setting offers two additional insights. First, the formation of a union among any country pairs is affected by the existence of financial links with other countries. As discussed above, the main benefit of joining a union is that the centralized agency will take into account regulatory externalities and, hence, standards will be tighter than under independent domestic supervisors. However, in the presence of financial linkages with “third-party” countries, this benefit will be tempered by a decrease in bank competitiveness vis-à-vis financial institutions from countries that did not join the union. This means that the existence of financial linkages with multiple countries makes the formation of unions among a subset of partners more challenging. Second, the formation of a union among a subset of countries reduces the incentives for those left out to join it. The intuition is immediate from the forces in this model. The union will reduce the race to the bottom among participating countries and tighten their standards. This reduces the potential benefits from joining in for those outside. In practice this means that countries that have strong financial linkages with third-party countries will find joining a partial union less attractive. Further, from the limited point of view of a model based on regulatory externalities, a partial union does not necessarily represent a pole of attraction that will naturally evolve into a more comprehensive one. The nascent Banking Union within the euro zone has inspired a set of recent studies focusing on the potential governance challenges in a “hub-and-spokes” supervisory regime: one where bank supervision is centralized but local supervisors provide the “boots on the ground,” being the parties more in touch with local financial institutions and thus in the best position to evaluate local banks’ portfolios. In Carletti et al. (2015), we explore, with a theoretical model, the tensions inherent in a supervisory framework in which a supranational agency has legal power over all decisions regarding banks; but local supervisors are in charge of collecting the information necessary for regulatory actions to be implemented. In particular, the paper focuses on how the governance design of the supervisory regime affects supervisors’ incentives to collect information when the local supervisor is “softer” than the central one; and, in turn, on how banks respond to changes in the regulatory regime. Colliard (2015) proposes a related model in which a centralized agency takes into account all the externalities related with a local bank failure, while the local supervisor takes less into account losses accruing to foreigners. In that model, the trade-off stems from the fact that the local supervisor has a comparative advantage in conducting on-site inspections. The frameworks in both papers are inspired by the supervisory reform in Europe. However, no stylized model can do justice to the many checks and balances and corrective procedures existing in a real-world supervisory mechanism. Rather, the analysis in these studies should be interpreted as identifying some of the tensions that the new supervisory regime will have to take into account in order to operate effectively. What follows summarizes the findings in these studies and provides a simplified example of the model in Carletti et al. (2015) to highlight the governance challenges in a hub-and-spoke regime and their potential effects on bank risk taking. In Carletti et al. (2015), banks are protected by limited liability and operate under asymmetric information. Thus, absent effective supervision, they tend to take on excessive risk. As in several previous models, leverage leads banks not to take into account the losses they impose on depositors and debt holders (and taxpayers when deposits are insured) when they fail (e.g., Hellmann et al., 2000, Matutes and Vives, 2000, Repullo, 2004). Bank risk taking is not directly observable and the associated asymmetric information prevents investors from pricing risk at the margin. The outcome in equilibrium is that banks engage in riskier behaviour than what is socially optimal. This market failure provides a justification for bank supervision aimed at containing risk taking (for instance, by enforcing capital regulation) so as to improve over this laissez-faire equilibrium. Start from the case with independent supervision. Local supervisors invest resources to collect information about a bank’s portfolio. This is meant to capture the process of learning about the assets and liabilities of a bank through on-site inspections and of estimating the potential risks associated with that structure. Upon obtaining such information, the local supervisor can let the bank continue to operate undisturbed. Or it can intervene it and force it to change its portfolio toward that deemed optimal by the supervisor (typically a safer portfolio). Intervention, however, comes at a cost. This can be seen as a reputational cost for the supervisor, the loss associated with the removal of a national (and private) champion, and/or it could represent a loss in efficiency associated with the transfer of the bank to the public sector. Under centralized supervision, local supervisors retain control of information collection, but are mandated to transmit to the central agency what they learn. The central supervisor can act on the information and has full control over the decision of whether or not to intervene a bank. Further, she chooses what portfolio to implement conditional on intervention. The critical assumption in the paper is that local supervisors have utility functions that are different from that of the central agency. The interesting case is one where they are less inclined to intervene in banks. Such reluctance to intervene may stem from greater costs that are borne at the local level for the supervisor, such as the aforementioned reputational costs and/or fiscal costs, or may reflect some degree of regulatory capture to which a central supervisor would not be subjected (see Agarwal et al., 2014, Acharya et al., 2013, and Bolton and Jeanne, 2011). This conflict results in a principal-agent problem between the central and local supervisors, in addition to that between supervisors and banks. When this conflict is severe enough, it may distort the local supervisor’s incentives to collect actionable information about banks’ balance sheets. The reason is that local agencies will, in some states of the world, prefer to remain ignorant rather than having to provide to the centre information that would lead to decisions that are against their own interests. Then, in equilibrium, less accurate information might be collected than under fully independent local supervisors or under a centralized agency that collects information directly. This poorer information collection entails costs. The central agency may be unable to enforce regulation on non-compliant banks. This, in turn, leads to poorer ex ante incentives for regulated banks which will tend to take greater risk than under alternative supervisory frameworks. A lower probability of having their actions discovered will make it more attractive for banks to take risk in excess of that desired by the regulator. In contrast, when the agency problem introduced by the split responsibility between local and central supervisors in not “too large,” the presence of the tougher central supervisor will reduce risk taking. To the extent that enforcement remains credible (that is to the extent that local supervisors continue to exert sufficient effort to collect actionable information), a centralized supervisor that imposes tighter standards (tolerates less risk taking) than local ones will increase regulatory discipline on banks. Put differently, banks will be induced to adhere to higher prudential standards if central supervision represents a greater threat of regulatory intervention. Consider the following example based on a highly simplified version of the model in Carletti et al. (2015). Assume banks in a certain country have access to three investment opportunities, characterized by “high”, “medium” and “low” risk. Each investment project, i, is characterized by the pair ( ), where is the return of the investment when it succeeds and qi the associated probability of success (with ). Let us rank the three investments so that the expected return is inversely related to risk: . From which it follows that “low” is the socially preferred investment. Where re is the opportunity cost of capital. So that fully levered banks, banks with zero capital, would prefer to invest in the riskier asset rather than the intermediate or the safe ones. This is a simple example of the classic risk shifting associated with limited liability. Essentially, banks do not take into account the losses associated with their failure. This provides them with incentives to take excessive risk. 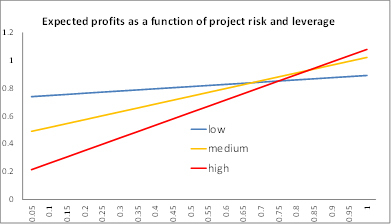 It is also immediate that one can rig the model so that, as bank capital increases (leverage decreases), banks first switch from the high-risk to the medium-risk project, and then for sufficiently high capitalizations from the medium-risk to the low-risk one2)For instance, consider the set of projects 3)Ri, qi) depicted in the chart: “low” (2, 0.9), “medium” (3.1, 0.5), and “high” (8.5, 0.15).. In this case, we can partition the line representing bank leverage in three zones: “high”, “medium” and “low” corresponding to a bank’s equilibrium choice of investment. It is immediate from this setup that, depending on bank capitalization, the laissez-faire equilibrium may or may not deliver the socially optimal allocation. When banks are highly capitalized, their individually optimal choices deliver the social first best. However, when they are not, the risk shifting stemming from limited liability and deposit insurance leads them to invest in socially suboptimal projects4)Note that risk shifting would emerge even in the absence of deposit insurance as long as bank risk is not priced at the margin (see Dell’Ariccia et al., 2014)..
Now consider a local supervisor/regulator that can inspect a bank under her jurisdiction5)For simplicity assume that there are no costs associated with inspection effort; or, more realistically, that costs are low enough that in equilibrium the independent supervisor exerts sufficient effort to make the regulatory threat credible. ; learn about the bank’s investment portfolio with some probability; and upon obtaining this information, intervene the bank and force it to invest in the socially optimal, “low” risk, project. Intervention, however, entails a cost, IL. Think about this as reputation costs or the costs associated with regulatory capture. In her inspections, the supervisor can choose to be “aggressive”, in which case there is a “high” probability of discovering actionable information; or “passive,” in which the probability of discovery is “low”. We can model the regulatory objective function as social welfare (in this case equated to the project’s net return) minus the cost of intervention. Then, upon learning a bank’s investment project, the regulator’s decision of whether to intervene the bank will be predicated on the increase in social welfare associated with a switch in projects exceeding the cost of intervention. Now we can ask how this equilibrium changes when the local regulator/supervisor transfers the authority to intervene to a supranational agency. In particular, consider the case in which inspections remain under the responsibility and control of the local supervisor, perhaps because of local expertise and logistical constraints. But the decision to intervene upon obtaining actionable information is up to the supranational agency. This governance structure may introduce an agency problem within the supervisory architecture when the objectives of the central and local supervisors differ. As in Carletti et al. (2015) on which this example is based, assume that the local supervisor has to transmit to the centre any actionable information she obtains. However, since, in the model, the quality and intensity of inspections is not observable, the central agency cannot affect the probability that information is actually obtained. Put differently, it is up to the local supervisor to choose whether to be aggressive or passive. Also assume that, upon intervention, the central supervisor suffers a cost IC, while the local agency continues to bear its intervention costs, IL. Here the difference between IC and IL fully summarizes the discrepancy between the two agencies’ utility functions. Obviously, one could consider a more complex model in which differences go beyond the cost of intervention. For instance, local and central supervisors may internalize to different degrees the spillover and contagion costs associated with bank failure (Colliard, 2015; Carletti et al., 2015; Calzolari and Loranth, 2011; Holthausen and Ronde, 2004). Now consider how the equilibrium changes as a result of this new governance structure. It is immediate that when the two supervisors’ intervention costs are close enough that they choose to intervene the same types of banks/projects, the equilibrium remains the same as in the baseline model. Put differently, if the two agencies’ preferences are “close enough”, the change in structure does not introduce any agency conflict in the model. However, when the costs are sufficiently apart that the two agencies choose to intervene different types of banks/projects, things may be different. Since the narrative of the Banking Union has been about strengthening regulatory action, take the case of a central supervisor that is tougher than the local one. In this case, the balance of two opposite forces will determine how the equilibrium changes relative to the single supervisor case. On the one hand, a tougher supervisor in charge of intervention decisions will increase the threat of intervention and impose greater discipline on banks. On the other, the agency conflict introduced by the split governance structure may undermine the credibility of supervisory action and decrease discipline. Essentially, the local supervisor may choose to be passive rather than aggressive. These effects are best demonstrated by an example with a “tough” supranational agency and a “medium” local supervisor. First, consider what happens in a system entirely consisting of low-capital/high-risk banks. 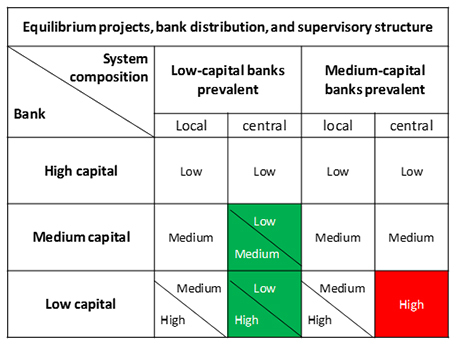 In the baseline model, the threat represented by the local supervisor induced these banks to switch from their laissez-faire high-risk project to the medium-risk one (see Table 1). Here there is no conflict between the two supervisors when it comes to these banks. Since in order to prevent the high-risk project the local supervisor has to exert sufficient effort to make the threat credible, the switch to a centralized structure will not alter its behaviour. It follows that the local supervisor will benefit from the greater discipline imposed by the central agency and low-capital banks will switch to the low-risk project. Next, examine what happens with medium-capital banks. For these banks the two supervisory agencies are in conflict. The local supervisor is “happy” with the banks’ laissez-faire choice since her cost of intervention exceeds the welfare benefits from switching to the low-risk projects. In contrast, the central supervisor’s intervention costs are low enough that upon observing a medium-risk portfolio she would intervene the banks to impose the low-risk project. Then, from the local supervisor’s standpoint, since intervention entails costs that she considers excessive, it would be better not to obtain actionable information from the inspection and prevent regulatory action. Finally, put it all together in a setup with both types of banks. Assume that the supervisor cannot discriminate across banks before inspection. Then, when deciding her inspection effort (determining the probability of discovering actionable information), the local supervisor will have to balance the benefits from disciplining low-capital banks with the costs of (what she sees as unnecessary) intervention of medium-capital ones. This means that the relative weight of low- and medium-capital banks in the system determines the result. When the system is primarily populated by low-capital banks, she will maintain her baseline effort. And as a result of the greater discipline imposed by the central regulator, average project risk will diminish. But when medium-capital banks are sufficiently prevalent, the local supervisor will find it best not to learn their type (she will choose zero effort). In response, there will be less discipline (relative to the baseline case) on low-capital banks, and average risk will increase. Table 2 summarizes how banks portfolio choices change with the supervisory/regulatory architecture. In essence, Table 2 shows that when the objective functions of the local and central supervisors differ sufficiently, the effects of supervisory centralization on banks risk taking are ambiguous. In this simple example, the result is a function of the distribution of banks, which in turns determines how the local supervisor chooses to balance the trade-off between the greater discipline provided by the tougher centralized agency and the loss of control over banks she does not want to intervene. In practice, obviously things are more nuanced and complicated. Yet, several of the insights from the theory remain valid. 3.2 When is the conflict likely to be more severe? The starting point of the analysis in Carletti et al. (2015) and Colliard (2015) is that the local and the central supervisors have different utility functions and, consequently, can take different decisions. Put differently, there are some states of the world for which the local supervisor would allow certain banks to operate while the central agency would prefer to intervene and resolve them. A second important tenet of these theoretical frameworks is that the agency problem between supervisors cannot be fully resolved through legal means (rules and regulations), compensation (side transfers between countries), or by the central supervisor taking over inspections and information collection directly((This last point is assumed away in Carletti et al (2015) and it entails a loss of supervisory efficiency in Colliard (2015).. In practice, the severity and relevance of the agency problem between supervisors will likely depend on several factors. First, banks may be systemic at the national but not the supranational level. If this is the case, the way a local and a centralized supervisor may decide to deal with lack of regulatory compliance may be very different. For instance, they will perceive the costs and benefits of a bail-in very differently; and, consequently, they will have a different approach to prompt corrective action and resolution strategies. Related, central supervisors internalize the cost of resolution, which may have negative externalities for other international institutions, more than the local agency. As discussed extensively in Colliard (2015), this may lead local regulators to be too forbearing (in the setup of our example, they have too high a cost of intervention) as they do not take into account the spillovers a bank’s failure may have on foreign creditors. Finally, the ability of the central supervisor to inspect banks directly and to condition the action of local agencies will evolve across types of banks and over time. It might be more severely hindered for nationally specialized banks for which local information and culture is essential to evaluate risks. But it might be less of an issue for banks operating internationally. Further, as the centralized agency gains experience and develops a deeper infrastructure, it will likely increase its ability to monitor banks directly and, thus, implicitly to enforce its preference on local supervisors. Based on these considerations, we expect the conflict between supervisors to be greater for: 1) Regional banks that are systemic for individual countries but not for the broader Banking Union as a whole; 2) Banks with significant cross-border activities; 3) Local supervisors in fiscally weak countries (these might be more reluctant to bear the cost of resolution and thus may be more forbearing); 4) More concentrated banking systems, as they are more likely to host locally systemic but not globally systemic banks (this might not be true in large countries); 5) Banks with regionally specialized characteristics. Two caveats before we conclude. First, this paper deals solely on issues of regulatory externalities and governance of a Banking Union. But Banking Unions may provide a host of other benefits, such as improved crisis management, avoiding sovereign-bank spirals, limiting inefficient ring fencing, and improving cross-border resolution (Farhi and Tirole, 2014; Goyal et al. 2013). It follows that our findings should not be taken as the outcome of a full-fledged analysis of the costs and benefits of joining a supervisory/regulatory union. Second, as for any other model, one could question how the building assumptions of our framework translate into practice. While we find the assumptions reasonable and the results relatively robust, there are obviously possible exceptions. That said, the analysis summarized in this paper provides valuable insights in the policy challenges faced by regulatory and supervisory unions. From that standpoint, it bears on the current debate on the implementation of the Single Supervisory Mechanism (SSM) in the Eurozone. In that context, it shows that centralization is likely to raise supervisory standards and deal with the perceived laxness and unwillingness to intervene banks that preceded the recent crisis. However, our analysis also brings into focus the governance challenges inherent in a hub-and-spoke supervisory framework. When the agencies in charge of information collection and implementation have sufficiently different objectives, absent corrective mechanisms, the switch to a centralized system may reduce bank discipline and consequently increase the risk of systemic problems. Further, the agency conflict at the source of the problem will be larger for laxer local regulators; exactly the cases that could in principle benefit the most from centralized supervision. The design of the SSM implicitly recognizes these challenges and provides countervailing measures. First, the ECB may take any bank in its jurisdiction under direct supervision. This will provide discipline on local regulators. Second, the choice of banks under central direct supervision (all locally and euro-zone wide systemic banks) is consistent with the degree of potential conflicts. Indeed, banks that are locally systemic but not systemic for the euro zone as a whole are among those for which views are most likely to differ. The fact that all euro-level systemic banks will also be under direct supervision has a similar effect, since these are the banks for which the externality from failure is likely to be valued differently by local and central supervisors. Finally, internal governance practices such as having ECB employees heading on-site inspection teams and rotating staff of different nationality on these teams will contribute to limit conflicts. Acharya, V., Drechsler, I., and Schnabl, P. (2014). A pyrrhic victory? Bank bailouts and sovereign credit risk. The Journal of Finance, 69(6), 2689-2739. Agarwal, S., Lucca, D., Seru, A., and Trebbi, F. (2012). Inconsistent regulators: Evidence from banking (No. w17736). National Bureau of Economic Research. Basel Committee on Banking Supervision, (2010), Report and Recommendations of the Cross-border Bank Resolution Group, BIS. Bolton, P., and Jeanne, O. (2011). Sovereign default risk and bank fragility in financially integrated economies. IMF Economic Review, 59(2), 162-194. Calzolari, G., and Loranth, G. (2011). Regulation of multinational banks: A theoretical inquiry. Journal of Financial Intermediation, 20(2), 178-198. Carletti, E., Dell’Ariccia, G., and Marquez, R., (2015). Supervisory Incentives in a Banking Union, IMF unpublished manuscript. Colliard, J. E., (2015). Optimal supervisory architecture and financial integration in a Banking Union, ECB Working Paper, No. 1786, April. Dell’Ariccia, G., and Marquez, R. (2006). Competition among regulators and credit market integration. Journal of Financial Economics, 79(2), 401-430. DellʼAriccia, G., Laeven, L., & Marquez, R. (2014). Real interest rates, leverage, and bank risk-taking. Journal of Economic Theory, 149, 65-99. Farhi, E., and Tirole, J. (2014). Deadly embrace: Sovereign and financial balance sheets doom loops. Unpublished working paper, Harvard University and Toulouse School of Economics. Goyal, R., Brooks, P. K., Pradhan, M., Tressel, M. T., Dell’Ariccia, M. G., and Pazarbasioglu, C. (2013). A Banking Union for the Euro area. International Monetary Fund Staff Discussion Notes No. 13/1. Hellmann, T. F., Murdock, K. C., and Stiglitz, J. E. (2000). Liberalization, moral hazard in banking, and prudential regulation: Are capital requirements enough?. American economic review, 147-165. Holthausen, C., and Rønde, T. (2004). Cooperation in international banking supervision, ECB Working Paper No. 316. IMF, (2010). Resolution of Cross-Border Banks—A Proposed Framework for Enhanced Coordination. Matutes, C., and Vives, X. (2000). Imperfect competition, risk taking, and regulation in banking. European Economic Review, 44(1), 1-34. Obstfeld, M. (2015). Trilemmas and trade-offs: living with financial globalisation. mimeo UC Berkeley. Repullo, R. (2004). Capital requirements, market power, and risk-taking in banking. Journal of financial Intermediation, 13(2), 156-182. Schoenmaker, D. (2011). The financial trilemma. Economics Letters, 111(1), 57-59. 1. ↑ The views in this paper are those of the author and should not be attributed to the IMF, its Executive Board, or its management. I would like to thank Elena Carletti and Robert Marquez for several discussions on the issues in this paper. 2. ↑ For instance, consider the set of projects ((Ri, qi) depicted in the chart: “low” (2, 0.9), “medium” (3.1, 0.5), and “high” (8.5, 0.15). 3. ↑ Ri, qi) depicted in the chart: “low” (2, 0.9), “medium” (3.1, 0.5), and “high” (8.5, 0.15).. In this case, we can partition the line representing bank leverage in three zones: “high”, “medium” and “low” corresponding to a bank’s equilibrium choice of investment. It is immediate from this setup that, depending on bank capitalization, the laissez-faire equilibrium may or may not deliver the socially optimal allocation. When banks are highly capitalized, their individually optimal choices deliver the social first best. However, when they are not, the risk shifting stemming from limited liability and deposit insurance leads them to invest in socially suboptimal projects((Note that risk shifting would emerge even in the absence of deposit insurance as long as bank risk is not priced at the margin (see Dell’Ariccia et al., 2014). 4. ↑ Note that risk shifting would emerge even in the absence of deposit insurance as long as bank risk is not priced at the margin (see Dell’Ariccia et al., 2014)..
Now consider a local supervisor/regulator that can inspect a bank under her jurisdiction((For simplicity assume that there are no costs associated with inspection effort; or, more realistically, that costs are low enough that in equilibrium the independent supervisor exerts sufficient effort to make the regulatory threat credible. 5. ↑ For simplicity assume that there are no costs associated with inspection effort; or, more realistically, that costs are low enough that in equilibrium the independent supervisor exerts sufficient effort to make the regulatory threat credible. ; learn about the bank’s investment portfolio with some probability; and upon obtaining this information, intervene the bank and force it to invest in the socially optimal, “low” risk, project. Intervention, however, entails a cost, IL. Think about this as reputation costs or the costs associated with regulatory capture. In her inspections, the supervisor can choose to be “aggressive”, in which case there is a “high” probability of discovering actionable information; or “passive,” in which the probability of discovery is “low”. The starting point of the analysis in Carletti et al. (2015) and Colliard (2015) is that the local and the central supervisors have different utility functions and, consequently, can take different decisions. Put differently, there are some states of the world for which the local supervisor would allow certain banks to operate while the central agency would prefer to intervene and resolve them. A second important tenet of these theoretical frameworks is that the agency problem between supervisors cannot be fully resolved through legal means (rules and regulations), compensation (side transfers between countries), or by the central supervisor taking over inspections and information collection directly((This last point is assumed away in Carletti et al (2015) and it entails a loss of supervisory efficiency in Colliard (2015).